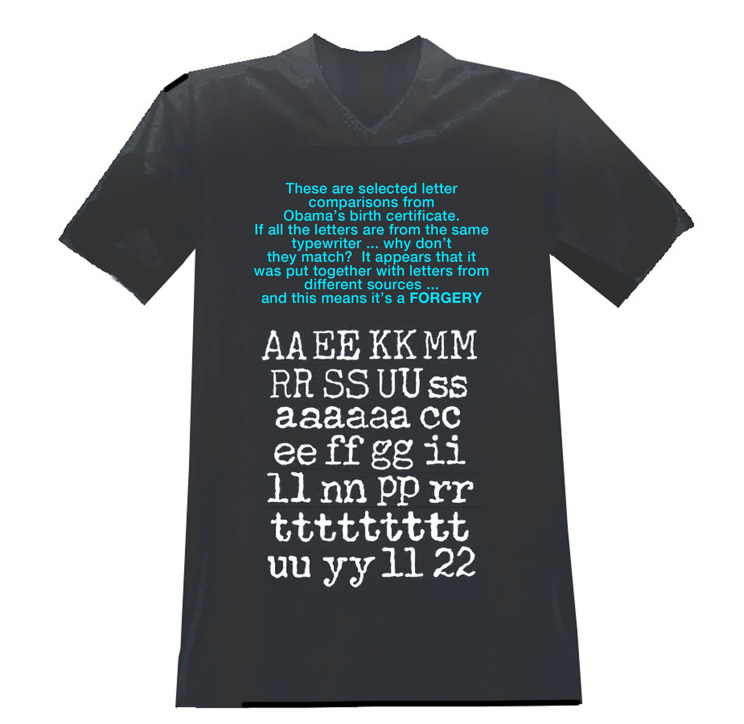 The junk document analysts have returned with another t-shirt to advertise their claims. …the Obama birth certificate released by the White House is a cut-and-paste composite created by using different parts of presumably authentic birth certificates that had been typed in Hawaii in 1961 on different typewriters. 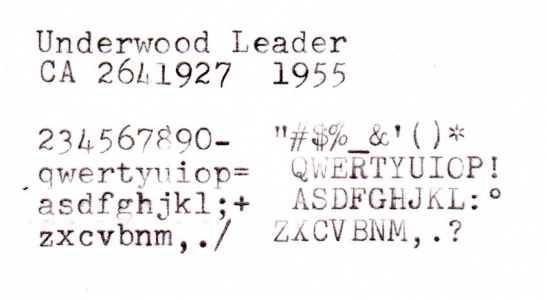 Irey isn’t saying that the typeface is different in different letters on the certificate, but that the individual letters are not exactly the same, suggesting different typewriters. However, the images he presents are 5th-generation digital images at best. A used typewriter ribbon is not uniform in density, nor does a human typist use the same stroke on every letter. We know that the Hawaii Department of Health made a copy of the original form, then the White House photocopied it for the Press, then the press scanned it, so we have scan, print, scan, convert from color to black & white, print and scan. Being a commercial printer, Irey appears to expect that characters are reproduced precisely in position, and at high quality. He appears to have no clue about 1961 government-issue manual typewriters. Looking at Irey’s image, I see what I would anticipate seeing, a multi-generation copy of a typewritten document. Maybe I’m more experienced looking at enlarged images of old documents than the average Joe, but I don’t see how this WND article would convince anybody. The question, then, is whether the variation between letters is normal given the human and mechanical variation of the machine and the limitations on the imaging technology used, or whether multiple typewriters (or images from multiple typewriters) is indicated. If someone were to try to prove what Irey asserts, they should compare the results of the Obama certificate with similar examples from other period documents, photocopied twice and scanned. They the results should be presented in a double-blind study. Irey does none of that. Irey has claimed that the Obama certificate is a composite document made from many original documents (why would anyone do that when they could simply use a real typewriter?) but he refuses to identify any of the typewriters involved. I haven’t identified the typewriter yet, but this one is close–but not exact. For comparison, I took my own birth certificate which is copied onto security paper, like the Obama long form, and then scanned it at 1200 dpi. Here are three examples of the letter “D” that show as much or more variation as what Irey found in the Obama form. But then again, my father’s name is misspelled which means my BC is an illegal fraud anyway. As I pointed out on the other thread “Dr” Irey is peddling quack medicine. He has treated a single patient complaining of a stomach ache with Compound X. Three days later, the stomach ache is gone, so “Dr” Irey proclaims Compound X is “good for what ails you.” Unless he treats a reasoonable sample of patients randomized to get either Compound X or placebo, his conclusion is junk science. Similarlly unless Mr irey, the typesetter, subjects a good sample (3-5 would be the minimum) of 1960s era Hawaiian birth certificates to the same analysis, his “science” and the conclusions based on it are junk. Typewriters and paper are not designed to produce masterpieces. The purpose was to efficiently produce usable documents for the many thousands of births that took place every single year in Hawaii. There will be imperfections on every single one. Guaranteed. As I pointed out on the other thread “Dr” Irey is peddling quack medicine.He has treated a single patient complaining of a stomach ache with Compound X.Three days later, the stomach ache is gone, so “Dr” Irey proclaims Compound X is “good for what ails you.” Unless he treats a reasoonable sample of patients randomized to get either Compound X or placebo, his conclusion is junk science. Typewriters and paper are not designed to produce masterpieces.The purpose was to efficiently produce usable documents for the many thousands of births that took place every single year in Hawaii. There will be imperfections on every single one.Guaranteed. He should produce a copy of his own birth certificate. It must be completely impeccable with every letter a perfect match. Farah is counting on these bigots to help pay off the credit card he used to buy Corsi’s book. I assume you put this article up a bit hastily. There’s several simple typos and minor grammar errors. Just wanted to give you a heads-up to do another pass-through proofread, so you can fix those. I am glad you did this Doc. This is what I suggested on RC Radio the other night that an “expert” like Irey should have done is to take a document that is known to have been typed on a single typewriter then scan it and do the same analysis for comparison. I believer the resolution on the LFBC is lower than 1200 dpi too. This latest analysis by Irey is laughable and if anything supports the authenticity of the document. Maybe, since many of the birthers have a childlike mindset when it comes to “evidence”, we could describe it like the kid’s game “telephone”. You know, where you whisper a message around a circle and by the end somehow it’s changed? Scan, print, scan, print, scan, print. Each step of the way there may be dust on the scanner, or a bump on the paper, or someplace where the ink didn’t really impress properly. Then add compression artifacts. Each of these steps adds another potential glitch. That said, since Hawaii has vouched for the data on the form, it doesn’t matter how much “Expert” analysis says the image is wrong. My office computer has two monitors. For various reasons, possibly including viewing angle, the monitors never match in terms of various colors, hues, brightness and contrast. Trying to adjust the settings has never worked. I wonder what the birthers would think if they saw the the birth certificate on both screens and noticed they looked slightly different. Reality Check: I believer the resolution on the LFBC is lower than 1200 dpi too. To do it right, one would need an original typewritten sample done on a typewriter with similar mechanical and ribbon wear as the one at Kapi’olani. Then it would have to be photocopied twice and then scanned. The high resolution scan of the White House photocopy that’s floating around looks to be about 600 pixels per inch. > I wonder what the birthers would think if they saw the the birth certificate on both screens and noticed they looked slightly different. My office computer has two monitors.For various reasons, possibly including viewing angle, the monitors never match in terms of various colors, hues, brightness and contrast.Trying to adjust the settings has never worked. Probably a lot of people have differences in color sensitivity between their eyes, so looking at the screen with each eye alternately covered will show differences. I wonder which eye birthers believe? Just pointing out the obvious here, but the the supposed differences that Irey identified are NOT differences in font or typography… but merely differences in quality of impression. Similarly, you would not see a difference between the size and shape of individual letters on a modern word-processed document, unless the creator was actually changing the font selection or size repeatedly every step of the way. Of course it would make no sense for a forger to do that — and again, the differences would be very different than the distinctions Irey has made. You’d either see a clear, generalized increase or decrease in the overall size of a letter – you can see that yourself by using MS Word to create different point sizes of a single letter for comparision – for example, create a letter that is 11pt, 11.5 pt, 12 pt, 12.5 pt, etc. (My version of Word won’t let me increment a letter size smaller that 0.5 points). Or, you are going to stylistic differences such as different types of serifs, individual letter being narrower or wider, or different renderings of letters such as a or g.
It can be admittedly difficult for an untrained eye to tell the difference between very similar fonts — for example, the Georgia font set is very similar to Bookman Old Style. But again, those aren’t the differences that Irey is highlighting. If he was truly an expert in typography, he would be able to identify the likely type face used, and then point to distinguishing characteristics, like the shape of a given serif. A manual typewriter almost by definition creates a set of letters with variations in quality of impression from one letter to another. You would need an expert typist, typing at a consistent rate, on a new machine with a fresh ribbon to avoid that result — and it would be very difficult for someone who was using a typewriter to fill out a form to achieve that, given the stop/start nature of form-filling. Add to that the fact that ink fades over time and even if you had the paper certification in hand, you would be looking at a photocopy of a 50-year-old document…… and of course Irey is either looking at a document made from a digital photograph of the photocopy, or more likely a digital photograph of a black & white photocopy of a photocopy printed onto colored security paper …. unless, of course, Irey is working from a PDF made from a scan of a photocopy printed onto colored security paper. I’d also remind everyone that last week the the big birther proof-of-forgery claim was due to the fact that they found two pre-printed boxes on the form that were absolutely identical in all respects, and they argued that the odds of two elements on the paper being identical was so extremely unlikely that it must be proof of a cut & paste job. So there you have it, from the birther’s point of view: if under magnification, the array of pixels in two similar elements are identical, it is proof of fraud. If under magnification, the array of pixels in two similar elements are not identical, it is proof of fraud. The only way that a birth certificate can be shown to be unfraudulent is if it doesn’t have the words “Obama” and “Hawaii” on the same page. Thanks for the analysis. I was preparing a reply to the WND article myself, something along the lines of, “I’ve just spent the last fifteen minutes reading up on document forensics, and it’s painfully obvious I already know more than Irey.” And based on nothing more than my own junior high school experiences typing up papers on an old manual typewriter my father “appropriated” from the navy when he was discharged in ’62, it was immediately obvious all of Irey’s supposedly damning variations are exactly the sort of commonplace variations one should expect from such a machine. 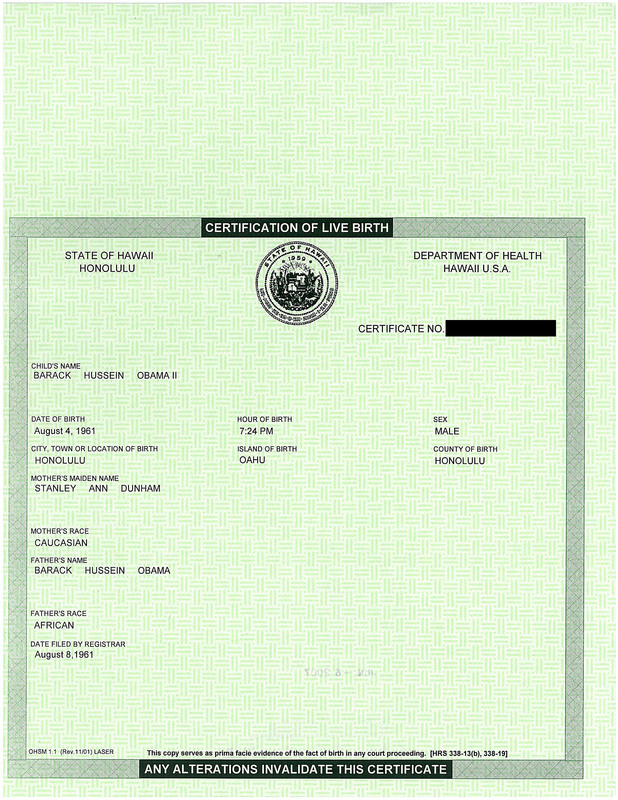 The only way that a birth certificate can be shown to be unfraudulent is if it doesn’t have the words “Obama” and “Hawaii” on the same page. Please scratch the words “and ‘Hawaii'”. Any card-carrying, birfer blueblood is genetically incapable of believing anything the president says or does, therefore “and ‘Hawaii'” is superfluous. BTW, it’s painfully obvious that image of the t-shirt is a fraud. A quick glance at the words — see how straight they are? the way they don’t pitch and yaw with the underlying fabric? — will show, to anyone willing to see the truth, that it’s an utterly amateurish Photoshop hack job. Someone obviously took a picture of a blank shirt, then cut-n-pasted text on top of it. It’s a fraud I tell you! A criminal conspiracy! Call your congressman! Write letters to your editor! Divorce your unbelieving spouse! Why hasn’t someone started impeachment proceedings against WND? Do you suppose anyone will actually order a t-shirt? Expelliarmus: Just pointing out the obvious here, but the the supposed differences that Irey identified are NOT differences in font or typography… but merely differences in quality of impression. 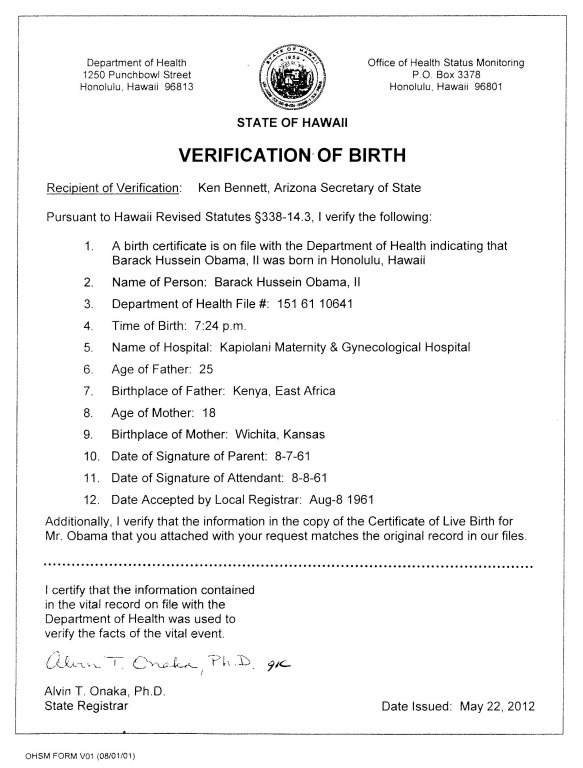 the Obama birth certificate released by the White House is a cut-and-paste composite created by using different parts of presumably authentic birth certificates that had been typed in Hawaii in 1961 on different typewriters. So the certificates in the composite could have come from the same model Underwood, but might represent individual machines with different type bar wear and ribbon condition. I need to update the article. I would note that it is quite possible that some parts of the genuine birth certificates were typed separately than others. It would have made some sense for a typist at the hospital to pre-type the name of the hospital & city & state on a blank certificate, then make a bunch of photocopies of the certificates, all with Kapiolani, etc., pre-filled (that would be fields 6a, 6b, 6c). It’s the kind of thing someone who is tired of typing the same thing over and over again might decided to do with the newfangled xerox machine in the office (the Xerox photocopier was introduced in 1959). I’m not saying that this was or wasn’t done — you would need to inspect the actual original certificate to determine whether it included lines of photocopied type — but I would note that the letters labeled 43-93 by Irey are all within that group that would be repeated text on ALL certificates issued by the same hospital, and logically should be excluded from comparison, since there is no particular reason to assume that those lines would have been typed contemporaneously with the rest. Even without a photocopy machine, a hospital typist might have chosen to pre-fill blank forms with that information during a time when she didn’t have much work to do, as a way of getting a head start on work that would inevitably be done later on. I’d add to my comment above that the differences Irey has noted among letters within that block — 43-93 — do not lend support to his theory, since if a person was doing a cut & paste forgery using valid certificates from 1961, logically they should have a good exemplar of a single certificate with all lines pertaining to the Hospital address and location filled out. And Irey is noting differences even within a single line of text — for example, the Kapiolani hospital name occupies characters 55-93. Irey notes differences in the t-66, t-71, and t-91, which come from the words “Maternity” and “Hospital” — why would anyone need to acquire those characters from separate sources? So rather than support his theory, Irey’s noted differences undermine his argument, because it provides a good example of “differences” in a line of type that can reasonably be assumed to come from a single source. I realize I’m approaching this kind of bass-ackwards from everybody else, but suppose I wanted to forge a birth certificate by taking images of letters from other birth certificates and pasting them in there. Once I’d found a good image to use for the first “t” in “Student”, couldn’t I just use that same image for the second t too? I mean, rather than going to all the trouble of hunting up a whole nother t in a whole nother document? In fact, I could use that same image for all the t’s. Wouldn’t that be a lot easier? Why wouldn’t I do that? Because you wouldn’t be able to have the state of Hawaii officially certify it. Daniel: Because you wouldn’t be able to have the state of Hawaii officially certify it. If you’re under the impression that I’m taking this man’s claim seriously, that’s not what I meant. Just, hypothetically, if for some bizarre reason I had chosen to forge a birth certificate by this cut-and-paste method, why wouldn’t I do it the easy way? Of course, I don’t know why I would have chosen such a roundabout method of forgery, anyway. I mean, there must be better methods. Why not just round up (or mock up) a form blank and type into it with an old typewriter? LM: Well, if I were concerned about that, I wouldn’t be forging it at all, would I? According to Corsi, the problem was that Obama could not find a good forger. Since Obama obviously could not have put the word out that he is looking for a first-rate forger to help him and certain officials in the state of Hawaii forge his birth certificate, he had to settle for whatever fourth-rate forger came along. Alas, the underskilled forger didn’t think to cut and paste from within the same document–he cut and pasted from several documents. Hence the bad forgery. Critical Thinker: According to Corsi, the problem was that Obama could not find a good forger. Since Obama obviously could not have put the word out that he is looking for a first-rate forger to help him and certain officials in the state of Hawaii forge his birth certificate, he had to settle for whatever fourth-rate forger came along. Alas, the underskilled forger didn’t think to cut and paste from within the same document–he cut and pasted from several documents. Hence the bad forgery. Ah. I …. see. That makes …… yeah, actually that still makes no sense at all. They couldn’t find a first-rate forger, so they had to settle for… what? A fourth grader? Because really, anyone older than that should have at least been able to come up with the idea of using the same letter image through the whole thing, rather than using different ones for the same letter. I may not be giving enough credit to fourth graders. Except that Obama clearly could get the both the previous and current directors of the Hawaii Dept of Health to vouch for him…. so logically, if there was a forgery, wouldn’t they be the ones to create it, using the tools they had on hand. 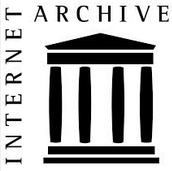 (Including plenty of copies of old birth certificates, all the right rubber stamps and seals). Either the DOH is party to a supposed “fraud” or it isn’t. If it isn’t, then their certification stands in the way of any claim of forgery. The birthers want to make the quality of the image the issue, which just isn’t the case. They think if they can find discrepancies in the image they can claim a forgery. What they don’t seem to get is that the image could have been drawn in crayon on wax paper and hot ironed on the whitehouse windows and it still wouldn’t matter. The thing that matters is the existence of the two certified true copies of the original vault form which were certified by HI officials and hand delivered to Obamas representative. Sef: I wonder which eye birthers believe? Whichever eye hates Obama more. It’s interesting that WND is just accusing the Obama administration of fraud. It a fraud was really perpetrated, the guilty parties would have to be the folks working at the Hawaii Dept. of Health. And yet WND doesn’t accuse them. Could it be that the private citizens at the DOH could sue them for libel, but it’s safe to accuse the president because he’s a public figure? LM: Ah. I …. see. That makes …… yeah, actually that still makes no sense at all. They couldn’t find a first-rate forger, so they had to settle for… what? A fourth grader? What grade is his daughter in? 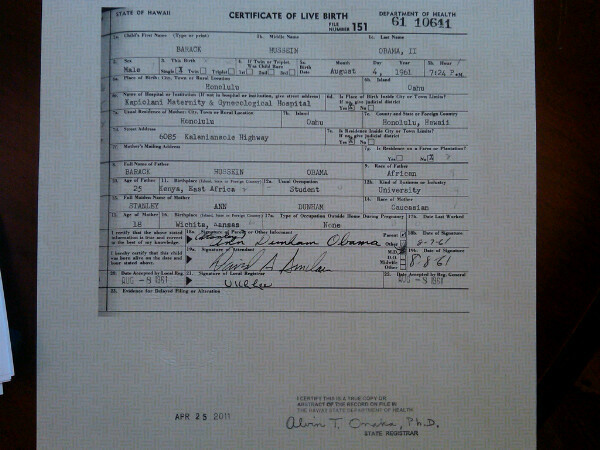 Honestly, Irey has put much effort in validating the authenticity of Obama’s birth certificate. 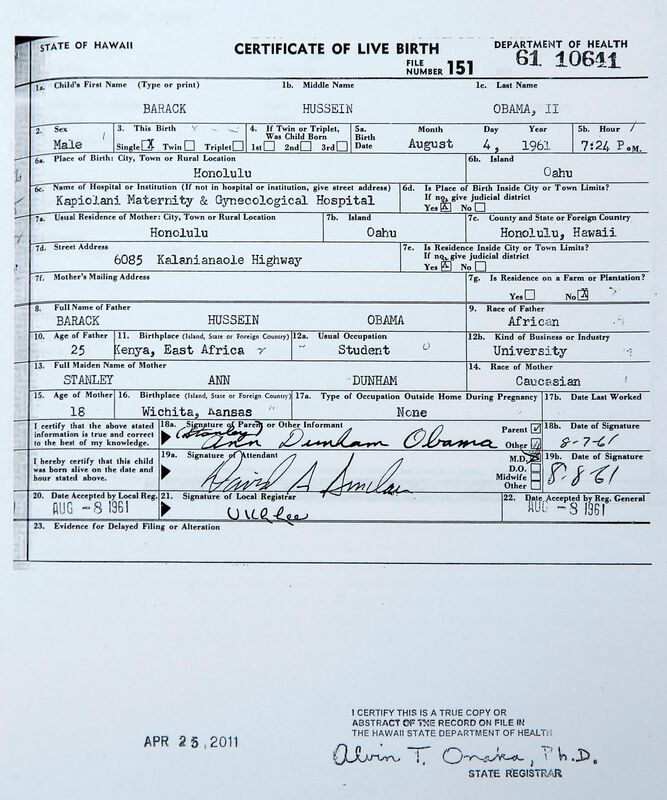 AnotherBird: Honestly, Irey has put much effort in validating the authenticity of Obama’s birth certificate. I think he did prove that all the typed letters on the form came from the same brand of typewriter.